Nexus 4 is Google's hit phone which is manufactured by LG. This is the fourth phone in the line of Nexus phones which has been able to power pack some neat hardware, with the latest Android version and the latest updates to Android as well. All this is available at a very reasonable price. The latest Android has some of the most advanced features seen in phones. One of them is the ability to block calls from numbers that you do not want. We do not need any external apps to do so. This tutorial teaches you how to block calls from numbers that you have saved in your phone. So you must already have the number you want to block. 1) Open your menu, the button that allows you to see all your apps. 2) Open your "People" app. This is the replacement for contacts while the function is the same. This will display the contacts that you have in your phone. 3) Click on the contact that you want to block to open his or her contact number. 4) Click on the options button. The button that looks like three horizontally placed dots. 5) A menu pops up with options that include Edit, Share, Delete, Set Ringtone, All calls to Voicemail, Place on Home Screen. 6) Press on the "All Calls to Voicemail" option. 7) You can verify your change by clicking on the option menu again to see if the "All Calls to Voicemail" option is checked with a check mark. What this does is send the caller directly to voicemail as soon as the caller is identified by phone. 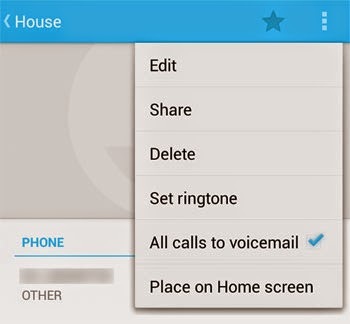 Your voice mail options will depend upon your carrier and whether you have switched it on or off. In my case, I do not have voicemail so the call from the unwanted person/number is rejected immediately.